For Our Country, Samuel Boyce, 1758, British Museum. I have taken some liberty with the title for this piece. This image might be the coat of arms for the Antigallican Society, or for William Blakeney himself in the role of president of that society. "For Our Country" is presumably the motto for that organization or that role. 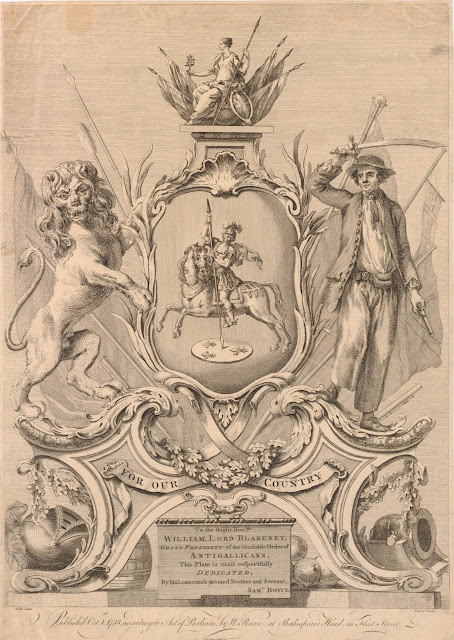 Either way, the coat of arms features St. George the dragonslayer driving his lance into the symbol of France, flanked by a lion with an imaginative mane, and a sailor with cutlass and pistol at the ready. The tar wears a single breasted short jacket that ends just below the top of his thigh with waist flap pockets but no collar. A round hat with short brim sits atop his head, beneath a blade that more properly resembles a scimitar than it does a naval cutlass. He has a solid color neckcloth that appears to be tied over his collar, and wears no waistcoat. His trousers are belted at the waist, along with a large pouch. I've never seen a pouch like this in any other image of eighteenth century British sailors, and so its purpose is beyond my knowledge. Perhaps it was a cartridge box? What do you think?